Fr. Michael Gillis shares from St. Isaac the Syrian (homily 62), in which St. Isaac offers us the metaphor of a manuscript in rough draft to help us understand why on-going repentance is important for Christians regardless of their real or imagined state of spiritual maturity. Fr. Michael shares reflections from his presentation on Theosis at the Orthodox Institute, held earlier this month at Antiochian Village. This is Part 3. Fr. 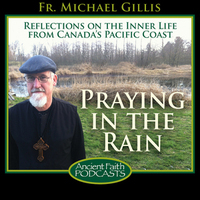 Michael shares his thoughts, and St. Isaac the Syrian's thoughts, about theosis. Life in the world is like a manuscript of writings that is still in rough draft. When a man wishes or desires to do so, he can add something or subtract from it, and make changes in the writings. But the life in the world to come is like documents written on clean scrolls and sealed with the royal seal, where no addition or deletion is possible. Therefore, so long as we are found in the midst of change, let us pay heed to ourselves; and while we have power over the manuscript of our life, which we have written by our own hand, let us strive earnestly to add to it by leading a good manner of life, and let us erase from it the failing of our former life. We have power to erase our debts from it as long as we are here. And God will take into account every change we make in it, so that we may be deemed worthy of eternal life before we go before the King and He sets His seal upon it. For so long as we are in this world, God does not affix His seal either to what is good or to what is evil, even up to the moment of our departure when the service of our fatherland [heaven] is completed and we set out upon our journey [to heaven at death]. St. Isaac reminds us that “so long as we are in the midst of change,” which is a reference to life in this world, we can rewrite the manuscript of our life. It’s never too late to change. A thousand mistakes can be counted as but a lesson in righteousness, if one finally learns from the mistakes and strives to act differently. The final copy of the manuscript is not written out and sealed until after we die. Whether or not my past sins are seen as evidence of a hard heart turned away from God, or those very same sins are seen as lessons in the hard-knock school of life softening my heart and turning me again toward God, remains yet to be seen. God Himself is waiting to see what we will do before He seals the document of our life. A whole lifetime of sin can be reinterpreted as pedagogy, as a painful and steep learning curve, if—like the good thief on the cross next to Jesus—we learn from it and repent. However, the sword of repentance cuts both ways. A lifetime of righteousness can be wiped out if we die in intentional, unrepentant sin. According to St. Isaac, neither the good of our life nor the evil is fixed for eternity so long as we are still breathing. If we are breathing, we can change in ways that will rewrite the entire story of our life. Then the word of the Lord came to me, saying: “O house of Israel, can I not do with you as this potter?” says the Lord. “Look, as the clay is in the potter’s hand, so are you in My hand, O house of Israel! The instant I speak concerning a nation and concerning a kingdom, to pluck up, to pull down, and to destroy it, if that nation against whom I have spoken turns from its evil, I will relent of the disaster that I thought to bring upon it. And the instant I speak concerning a nation and concerning a kingdom, to build and to plant it, if it does evil in My sight so that it does not obey My voice, then I will relent concerning the good with which I said I would benefit it. But in a great house there are not only vessels of gold and silver, but also of wood and clay, some for honour and some for dishonour. Therefore if anyone cleanses himself from the latter, he will be a vessel for honour, sanctified and useful for the Master, prepared for every good work. Notice the Apostle says that whether or not one ends up as a vessel of honour or dishonour depends on whether or not one is willing to cleanse oneself from the latter (the dishonour). We each cooperate with the grace of God in our life determining what kind of vessel we will be in our Father’s house. The plasticity implied by this image of being formed into a vessel is both beautiful and terrifying. Who I become in this life and in the age to come is not determined by me—God is the one who forms the clay. But at the same time, my willingness to cooperate with the grace of God influences in some way what God decides to form—even to the point of God “repenting” of His originally stated intention. And this “repentance” of God can go either way: a sinner can become a saint and a apparent saint can become a sinner. Jeremiah is not the only Old Testament prophet to speak of this plasticity in determining our eternal destiny. Twice in Ezekiel (Chapters 18 and 33), we are told that both sin and righteousness can be wiped out, or reinterpreted, based on repentance. But if a wicked man turns from all his sins which he has committed, keeps all My statutes, and does what is lawful and right, he shall surely live; he shall not die. None of the transgressions which he has committed shall be remembered against him; because of the righteousness which he has done, he shall live. Do I have any pleasure at all that the wicked should die? says the Lord God, and not that he should turn from his ways and live? But when a righteous man turns away from his righteousness and commits iniquity, and does according to all the abominations that the wicked man does, shall he live? All the righteousness which he has done shall not be remembered; because of the unfaithfulness of which he is guilty and the sin which he has committed, because of them he shall die….. Here in this passage we get a bit of a glimps into why it may be that God does not remember the sins of a repentant sinner nor the righteousness of one who turns toward sin. The sinner, we are told, “preserves himself alive” because he “considers” his life and makes the necessary adjustments toward God and righteousness. That is, in considering his past mistakes, the former sinner learns from them and thus the past sins are no longer seen as a rejection of God’s love, but as pedagogy, as the lessons through which this person learns to turn to God and to do righteousness. On the other hand, the righteousness of the formerly righteous one is not remembered because this one has been unfaithful: having experienced and known the love of God, this one turned his back on the God who had been so good to him. Ezekiel 33:13 adds this little bit more to help us understand why God does not remember the former righteousness of the one who turns to sin: “When I say to the righteous that he shall surely live, but he trusts in his own righteousness and commits iniquity, none of his righteous works shall be remembered; but because of the iniquity that he has committed, he shall die.” The unfaithfulness mentioned in chapter 18 is caused by the righteous person trusting in his or her own righteousness. But is there still hope for someone who has lived a righteous life and then fails? Is there still hope for this person? Certainly, so long as you are breathing, there is hope, abundant hope. It all depends on how you look at it—the manuscript is still being written. If you depend on your righteousness to save you, then your sin wipes out your righteousness. However, if you consider your sin and repent and strive to do right, then your sin will be erased from the manuscript of your life. Repentance is possible for anyone, no matter how high they have climbed or how far they have fallen.